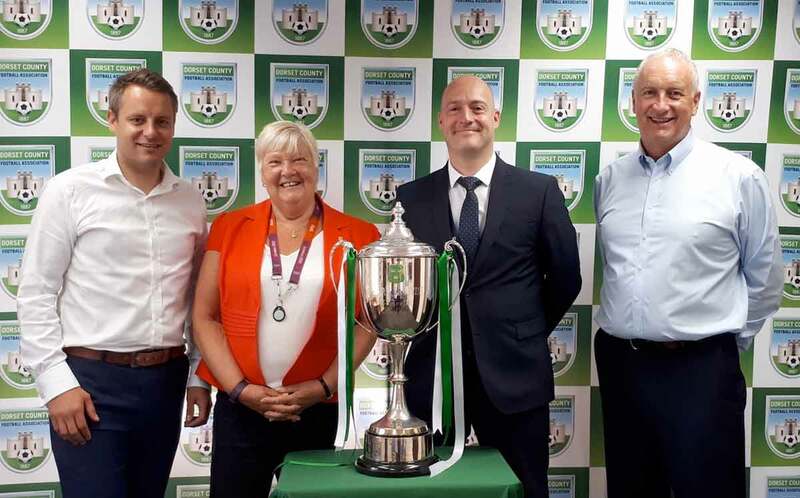 Caption: Andreas Booth, Tim Bennett and Dan Ormesher from Specsavers with Sue Hough, CEO Dorset County Football Association. From 1 July, the County Ground will be renamed Specsavers County Ground as part of partnership agreement with Specsavers during their support of grassroots football in Dorset for the next three years. The Dorset Youth Cup will also be known as the Specsavers Dorset Youth Cup. The Youth Cup comprises seven different age groups from under 10 to under 16 years with teams represented from clubs across the county and concludes with the finals, which will be held at the Specsavers County Ground. The sponsorship deal will be celebrated by an official launch game at the Specsavers County Ground on Wednesday 25 July with kick off at 7.30pm. Bringing the best in football together the Dorset County FA will welcome Wimborne Town FC and Poole Town FC who will play for the Mark Frowde Trophy as part of their pre-season schedule. Andreas Booth, regional chair for Specsavers in Dorset says on behalf of his colleagues, “Together, Specsavers and the Dorset FA share a common goal: to enhance everyone’s health and wellbeing, regardless of one’s age, gender and physical capability.